Since dinner, I’ve made two cheeseballs and a batch of Magic Cookie Bars, we all watched The Muppet Christmas Carol, and as soon as this is done I’m going to pre-cut felt pieces for making felt ornaments at a big ol’ holiday craft-a-thon I’m helping with tomorrow. Part of the feverish preparations are because we’re getting our Christmas tree tomorrow morning, then decorating it on Sunday. At our house, it’s absolutely essential that we have delicious treats to eat while decorating the tree. We generally skip dinner (maybe soup) and eat treats like cheese and crackers and olives and, of course, treats. Decorating the Christmas tree is both girls’ favorite part of Christmas (according to recent polling data and in-school research), so we must be doing something right. Of course, a new favorite tradition is cutting down our own Christmas tree. 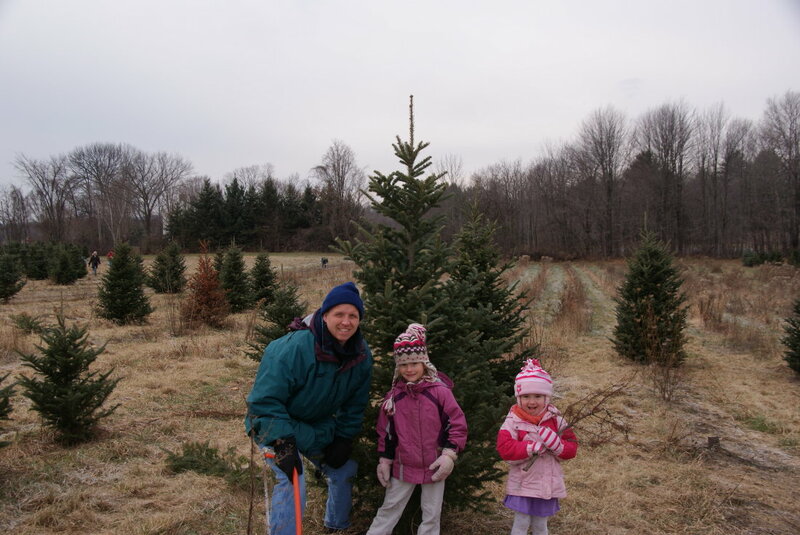 Have you ever cut down your own Christmas tree? You should absolutely try it. What an adorable family! But you should see that gorgeous chick dragging a tree on the other blog. . . . But you’re not sure where to go, or how to do it, or if you need to bring your own saw? Oh, no! Lucky for you, I wrote a post all about it for All Over Albany. Go visit! Hopefully I’ll be contributing more there in the future. I love your tradition of skipping dinner and snacking on yummy treats while trimming the tree! Maybe we’ll try that when my son is older. Great article in All Over Albany! Enjoy trimming the tree and all the wonderful treats that go along with the creating your family Christmas tree.